Earlier on Tuesday, Iran’s prosecutor general has directly named a CIA official as being the “main designer” of the protests that have been going on in the nation’s capital, Tehran, for more than a week. According to the latest report from The Washington Post, Iranian state-run news agency IRNA carried comments made by Mohammad Jafar Montazeri, saying that a CIA official headed an operation that caused and ultimately fueled the Iranian protests. Montazeri also claimed that the CIA operation had support from both Israel and Saudi Arabia, Iran’s two biggest regional adversaries. He continued his address, alleging that the CIA had planned to turn the protests into an armed insurrection by mid-February. If the protests were to continue until then, it would mark the 39th anniversary of the 1979 Islamic Revolution, which saw the overthrow of the pro-western, U.S.-backed Pahlavi dynasty. As reported by ABC News, Montazeri said that the CIA official sought help from exiled Iranian groups and was preparing for various scenarios that included protesting the high cost of living and financial demands on the elderly. He also stated that the plot most likely focused on fomenting dissent from the countryside in order to shake up the establishment in Tehran. Despite the very detailed report describing the incident, the Associated Press has not published the name of the CIA official as he is most likely to be a part of its secret service. No other CIA or government officials have also been identified in the report. Montazeri’s comments were most likely an attempt at discrediting the protests that have been raging in Iran’s capital for seven days straight. 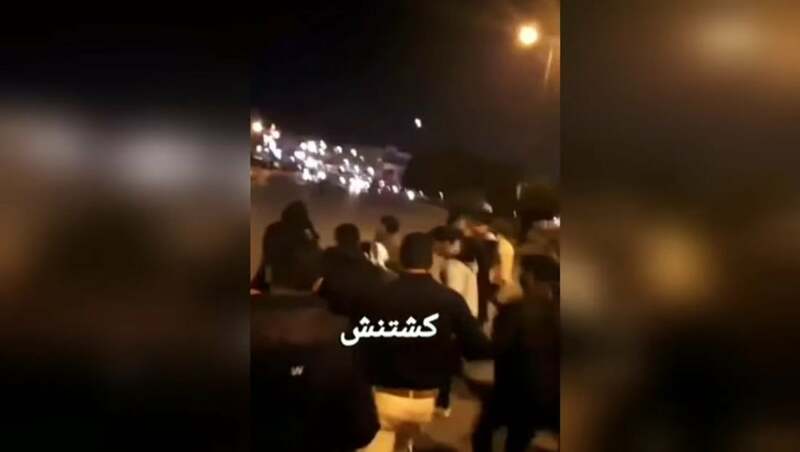 The extremely violent Iranian protests, which have quickly spread to more than 40 cities across the country, have raised questions about the challenges the Iranian people face. After the nuclear deal Iran made with the U.N. Security Council, the extremely high unemployment rate, rising inflation, and weak economy were all expect to subside. According to Reuters, a senior Trump administration official said on Wednesday that the U.S. has not played any role in the Iranian protests and that the speed and force with which they’ve spread across Iran was not expected. “The protests were entirely spontaneously generated,” said the official, who spoke on condition of anonymity to discuss intelligence matters, and as reported by The U.S. News. ABC News cited another U.S. government official saying “This was not on our radar,” when asked about whether or not the U.S. was expecting the Iranian protests. Both officials said they believed conservative opponents of President Hassan Rouhani, seen as a relative moderate within Iran’s clerical government, started the demonstrations in Mashhad. However, as the protests spread fast throughout Iran, it ABC states that it Rouhani has most likely lost control of them. Experts on the topic, as well as reputable political analysts also seem to share this belief. Despite the U.S. denying its involvement in the Iranian protests, a top Russian diplomat warned the U.S. not to meddle in Iran’s internal affairs. The official, speaking from Moscow, stated that Washington’s intent was to use the unrest to undermine the nuclear deal it made with Iran in 2015. “We warn the U.S. against attempts to interfere in the internal affairs of the Islamic Republic of Iran,” Deputy Foreign Minister Sergei Ryabkov told the state news agency Tass on Thursday. Continuing his comment, Ryabkov also said that Washington “is tempted to use the moment to raise new issues with regard to the JCPOA.” The Joint Comprehensive Plan of Action, known commonly as the Iran deal, is the international agreement that limits Iran’s nuclear program, including restricting uranium enrichment for 10 years. Iran agreed to the deal in exchange for lifting the economic sanctions that were affecting the country. U.S. Vice President Mike Pence said earlier on Wednesday that the U.S. wants to modify the JCPOA, as it wants the agreement lasting longer than the previously agreed upon 10 years. Despite the overwhelming number of people joining the Iranian protests across the country, on Thursday thousands rallied in support of the government in dozens of towns and cities, including in the northeastern city of Mashhad, where the anti-government protests began and extended to other cities. Iranian state television has repeatedly broadcasted nationalistic songs and given the pro-government rallies significant media coverage. Often describing the pro-government rallies as an “answer to rioters and supporters to the riot,” the Iranian state-run media appears to have taken a strong stance against President Trump. Tweeting several times in support of the anti-government rallies, saying that “the people of Iran are finally acting against the brutal and corrupt Iranian regime,” Trump has become a widely hated figure in Iran. Speaking to an Iranian news channel on Tuesday, Interior Minister Abdolreza Rahmani Fazli said that about 42,000 people at most took part in the week of protests, saying they went on as long as they did because of the “leniency, restraint, tolerance and interaction” of the government. Fazli failed to elaborate on his comments and did not say how the government plans to tackle the Iranian protests. While vague, Fazli’s comments marked the first government estimate of participation in the protests and appeared timed so authorities could contrast it against the mass crowds brought together for the pro-government demonstrations. In response to the Iranian protests, which have seen at least 21 people killed and more than 450 detained, the government was quick to shut down social media channels that “enabled the protesters to organize.” As Facebook and Twitter have been blocked in Iran since 2009, Iranians have mostly been relying on Telegram to spread messages about upcoming protests and share images from demonstrations. With more than 40 million Telegram users currently residing in Iran, the app’s power can hardly be contested. After shutting down Instagram, authorities have also cracked down on Telegram, making it hard for people to communicate with each other and upload videos and images from the protests. The suppression by Iranian authorities has made it difficult for outside sources to analyze the situation, resulting in the U.S. government looking into its options at helping to open up the internet in Iran.